FLEXIBLE packaging manufacturer RPC bpi protec has developed a new film it is touting as a “game changer” for the sector. The company claims its new film is able to deliver the type of oxygen and water vapour barrier protection that could previously only be achieved through the use of a laminated structure. However, whereas laminated packs can be difficult to recycle, RPC describes this new bpi protec film as being both fully recyclable and can incorporate recyclable material. The pouch has been tested to ASTM industry standards F1249 and D3985, achieving an oxygen transmission rate of below 3cc/m2/day and water vapour transmission rate less than 1g/m2/day at ambient temperatures. “We have ‘cracked the code; in terms of developing sustainable solutions without compromising on the requirements of brand owners and end-consumers for practical, attractive and user-friendly packs that meet the needs of today’s modern lifestyles,” said Frank Doorenbosch, RPC bpi group CEO. In its first commercial application, the film is being used for RPC bpi protec’s X-EnviroPouch stand up pouch. The manufacturer said that the incorporation of moisture and oxygen barrier into the pouch provides an extended shelf life for a variety of ambient products such as cereals and pet food. The pack is available in white or natural film from 60-140 microns, in various sizes in gloss or matt finishes. The pack can also be reclosable with a ‘prestoclose’ seal or supplied as a film on the reel for the packer or filler to form themselves. 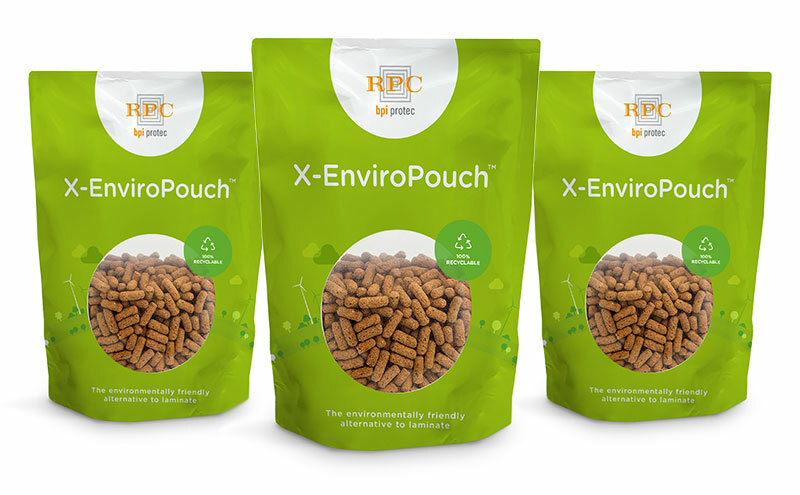 David Lumley, managing director of RPC bpi protec said, “We have already seen a tremendous interest in X-EnviroPouch due to its ability to be recycled. Providing an even more sustainable option for this popular format through the incorporation of the oxygen and moisture barrier now makes it even more appealing.